Buy, Track and Redeem Seize the Deal® purchases with your mobile device. Just when you thought getting daily discounts with Seize the Deal® couldn’t get any easier, it just did! We bring daily deals to you directly on your mobile device. Check out Seize the Deal® anywhere now with our free app for the iPhone, iPad and Android. Seize daily deals with the touch of a button. No more searching your inbox for Seize the Deal® e-mails. 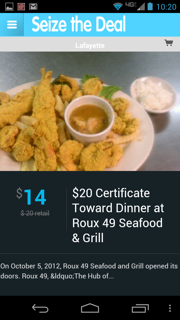 Redeem your deals easily with your phone or iPad. No more paper printouts! Go Green! Even better, no more worrying when you get to a restaurant or store if you have the Seize the Deal® voucher with you. No more digging through your purse or car to find the paper printout. It’s on your phone and can be scanned by the business you are visiting. View reviews, details and highlights about a business featured on Seize the Deal®. Click to call the company featured from your cell phone if you want to ask them any questions before buying. Keep track of your purchases and gifts. Don’t remember what you’ve bought so-an-so on Seize the Deal®? Get a list of all your purchases and gifts from your mobile device.